This book does not constitute medical advice, but rather is a curated summary of disruptive findings and expert-recommended protocols regarding a certain treatment used for cancer. Please consult with a licensed physician before starting any treatment or therapy. All interviews and consultations in preparation of this material were done with licensed physicians who also use conventional oncological medicine. 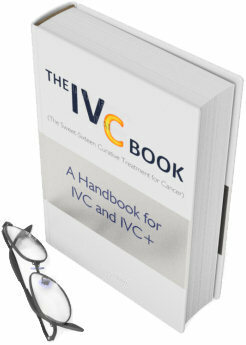 The aim of this book is to demystify IVC and encourage best practices improving treatment efficacy. This work is the culmination of curating and digesting over 230 respected peer-reviewed medical articles on the subject and consultations with experts in the field. It was created to standardize IVC practices and help demystify prevalent misconceptions about IVC (Intravenous Vitamin C), the most storied integrative curative treatment for cancer. It’s a short yet comprehensive easy-to-read handbook justified with comprehensive peer-reviewed citations. No dumbing-down errors. Health books that are written in part for laypersons often simplify in a way that misrepresents treatment efficacy instead of accurately describing in terms of probability. Peer-reviewed journal articles don’t err in this way. Neither does this book. No hyperbole. This book presumes that the reader can think for themselves when given the data straight in a natural and intuitive way. Patient Empowerment. The goal is to help the patient to be prudent, “fight” on their own terms, and get the best care to maximize their treatment efficacy. Among other things, we hope that this book further helps to standardize best practices among IVC practitioners by bringing to light various protocols and recommendations put forth by the foremost recognized and respected experts in the field. A generalized assessment of the primary parameters for IVC efficacy and potential opportunities pronounced herein will also help prioritize forward-looking research to make more efficient and expeditious strides forward. IVC is the most reputable integrative treatment for cancer. It is curative when combined with other treatments also of a conventional or integrative nature. There is no other treatment for cancer which has as much peer-reviewed literature from respected medical journals demonstrating as many anti-cancer mechanisms. Only IVC improves all of the 16 QOL (quality of life) factors enumerated herein while also addressing all of cancer’s “dirty dozen” strategies for sapping away a patient’s life.